The 2012 Presidential race is about to get more lively thanks to something quite dead – the news that A. Zombie, America’s first Zombie Presidential candidate, is entering the race. A formidable third party contender for the nation’s highest office, A. Zombie is slated to announce his candidacy at a high-energy rally on Monday, August 20th at Westfield Horton Plaza in San Diego. The candidate and his human wife, Patty Morgan-Zombie, will then commence a cross-country bus tour that will take them to six major U.S. cities including Tampa and Charlotte, where they will bring their pro-zombie message to the Republican and Democratic Conventions. 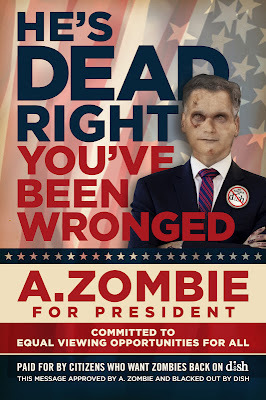 The A. Zombie for President Campaign is organized by AMC Networks, home to AMC, WE tv, IFC and Sundance Channel. Satellite company DISH dropped these networks earlier this year because of an unrelated lawsuit and is now in the disadvantaged position of being the nation’s only major television provider without these channels and their popular shows. 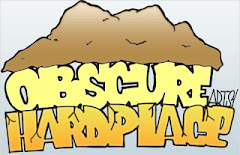 A one-issue candidate, A. Zombie’s mission is to rally zombie fans around the country who don’t have access to these networks and shows to find an alternative television provider before the highly-anticipated third season premiere on October 14, 2012 of A. Zombie’s favorite show, AMC’s The Walking Dead, the most watched basic cable scripted drama series among DISH subscribers, according to the Nielsen company. At present, A. Zombie’s campaign juggernaut is slated to motor to: San Diego (August 20); Dallas (August 24); Tampa for the Republican Convention (August 28); Atlanta (September 1); Charlotte for the Democratic Convention (September 3 - 4) and New York City (September 5). For more information about the campaign, please visit: www.azombieforpresident.com.